One of our favorite lines this spring for that oh so stylish tot is the signature collection from Petit Couture. The luxe owl and glitter tee along with the perfect loungy dresses are all a big hit this season. The SPRINKLES top pick is the classic owl motif sparkle dress (above) in pink with disco ($52) & the black with luxe short-sleeve signature play set ($65). Stay tuned for the updated signature collection pieces for layette and play wear. They will be making their debut in all new colors & organic fabrics available in the coming weeks. In the meantime, lucky for us, we have gotten to know and had the pleasure of chatting with the main momprenuer herself Rebecca Kaykas-Wolff. 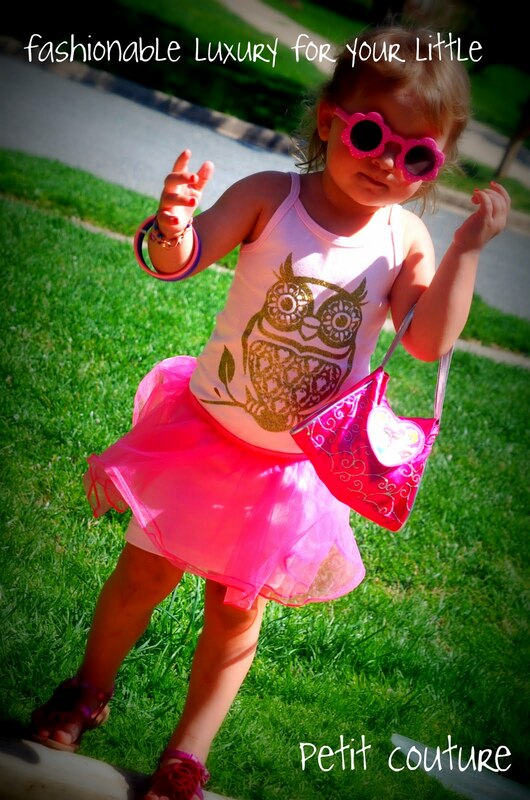 Rebecca sent us over a few signature pieces which quickly soon became an immediate obsession by our mini-fashionistas. What inspired Petit Couture? Tell us about that adorable signature owl. I knew that I needed to create "something" after the birth of my first daughter, Simone. She inspired me and I began looking for sourcing and manufacturing opportunities. My original idea was to manufacture in Egypt because that is where my mother lives, but the travel precluded me in doing so - and quite honestly - I didn't want to spend time away from Simone. However, I wasn't able to really get Petit Couture off the ground until my 3rd child, Julien, was born due to other professional responsibilities. When Julien was born and my husband accepted a Sr. role with a software company in Portland, Oregon I had the opportunity to stay home and focus on Petit Couture (while he commuted from Seattle to Portland each week for a year!). I had ample time (after 8 p.m.) to focus onPetit Couture. The Signature owl was a culmination of several things, but mostly the way that I initially started Petit Couture was by defining the brand. I wanted to make an apparel and accessories business that embodied three things: Something that was elegant, whimsical and modern. After the brand was defined the next step was constructing the logo that would help embody these elements - an owl represents all three and with the signature 'brocade' on his belly further defines the brand. You'll see that pattern used on the new Ready to Wear pieces out later this year! What challenges do you face as a mompreneur? What is up next for Petit Couture? I'm debuting the Ready to Wear collection later this year (August) and the line is currently represented in LA by Grand Avenue Baby as well as in Dallas by JAG Apparel Group. I'm personally discussing the line with some major retailers and hope to have some great announcements in the coming months. Once I finish the Holiday '10 and Spring '11 Collections I'll start working on Summer '11 ;). Petit Couture will also continue to invest in social media tools and technologies - I LOVE the connections I've personally made with other fabulous mamapreneurs across the globe. 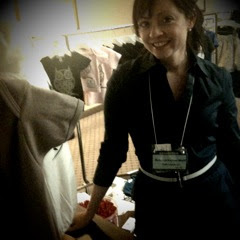 There is an entrepreneurial sisterhood that I had no idea existed prior to starting Petit Couture. Since technology is in my DNA (I worked for 15 years in management positions for companies like TMobile and Microsoft) - it will continue to be something that is a unique component to the way Petit Couture is run as a business. Rebecca Kaykas-Wolff resides in Portland, Oregon where she oversees Petit Couture business operations and spends time with her husband Jascha and children Simone, Sofie and Julien who are routinely seen in Petit Couture ads. She is a pround member of the Oregon Entrepreneurs Network and Mamapreneurs, Inc. where she routinely has the opportunity to evangelize Petit Couture. She has a 15+ year background in digital marketing and online communications holding senior management roles with companies such as T-Mobile, HL2, Safeco/Liberty Mutual and Microsoft Corporation. Petit Couture’s Signature Collection is sourced and made lovingly in the US. LET'S NOT FORGET THAT GIVEAWAY ! ! ! Rebecca has offered one very lucky reader a Petit Couture gift certificate for $25 for their favorite Petit Couture piece - a perfect addition to your littles wardrobe! To enter you MUST tell us what item is a must have. You also must be a follower of Cupcake Mag & Sprinkles. These comments ARE mandatory. 5. Become a Petit Couture facebook fan here. 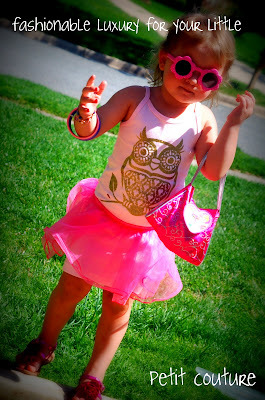 Start tweeting, following & commenting ASAP -- Petit Couture is a MUST in your fashionable tots wardrobe. And while you wait head over to the Petit Couture blog to get all the details on our this stylish line. Ummm...can I be selfish and say that I want the burnout tee for myself? Otherwise, I love the new sparkle dress! I love the owl. The Signature Cap Sleeve T is my favorite. I love the black sparkly owl dress. Ohhh! My husband would LOVE this store! I LOVE the sparkly dress, but my daughter is only 6 months so I would go with the Interlock One-Piece Short Sleeve in White. Became a Petit Couture facebook fan! OMG........the Sparkle Dress is DE.LI.COUS!!! !